CODA – a Tribute to Led Zeppelin are the most exciting and authentic tribute to Led Zeppelin and this year they are celebrating 50 years of Led Zeppelin throughout 2019. 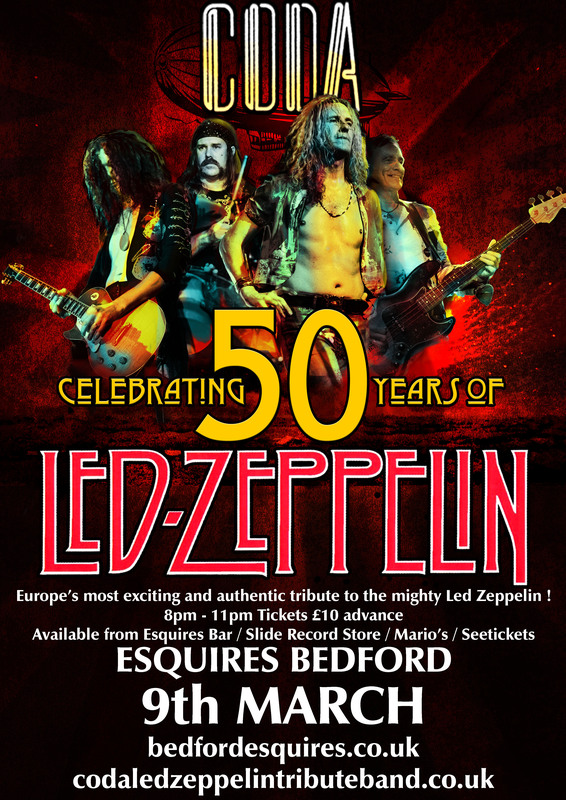 Their tour stops off in Bedford on Saturday 9th March at Bedford Esquires. Why a Led Zeppelin tribute band? Well, the story starts 29 years ago when drummer Simon was given a copy of Led Zeppelin II on cassette (remember them? Nope, thought not!) This led (pun intended) to a life-long love of Led Zeppelin, with Simon become an avid consumer of all things Led Zeppelin, including albums on vinyl and CD, bootlegs, live video tapes and books, notably by incredible Led Zeppelin chronicler Dave Lewis of Tight But Loose. Whilst Simon was busy gigging with various bands in and around Hertfordshire, he also had a yearning deep inside to form a Led Zeppelin tribute band, such was his love for the playing of John Bonham, and the music of Led Zeppelin. Simon would spend countless hours perfecting his John Bonham grooves whilst simultaneously searching for the right personnel to form the ultimate Led Zeppelin tribute band. Eventually it came to pass that Simon made contact with a guitarist called Nigel, and a bassist called Julian, and together they formed the nucleus of what promised to be an awesome Led Zeppelin tribute band. Whilst rehearsing a fantastic set of Led Zeppelin tunes, Simon spent a whole year searching the length and breadth of the country for the ultimate singer for his Led Zeppelin tribute band. Sadly, no such singer was to be found and Simon, down-heartened and dis-spirited, gave up on his quest for a while. Fast-forward to more recent history, after a period that involved various musicians in various bands, playing the music of Led Zeppelin all over the world, life changed for Simon and once again he gave up on his dream. Then, it was an advert on Gumtree that caused him to rekindle his desire to form the best Led Zeppelin tribute band in the UK. Joining up with singer Nikki, he recruited guitarist, and Led Zepplin fan, Glen from the covers band he was in, and they auditioned for a great bassist, and soon found one in the guise of Ant, who now plays with the Lambrettas. This line-up rehearsed and were almost about to play their first gig when disaster struck and the gig was cancelled. Sadly the band separated from their singer and once again the search was on again. During this time, guitarist Glen had to leave due to family commitments, leaving Ant and Simon to place more adverts in order to find a singer and guitarist to fill the vacant slots in this rapidly diminishing Led Zeppelin tribute band! After a few auditions, guitarist Adam Rose-Alison came on board, along with a singer who was to be short-lived in the newly-named CODA – a Tribute to Led Zeppelin. After a few gigs it quickly became apparent that Adam was exactly the sort of person that Simon had been looking for in order to form the ultimate Led Zeppelin tribute band. With his extensive knowledge of live Led Zeppelin bootlegs, and his ability to play the guitar like Jimmy Page, and his skill in guitar building which resulted in him building a replica Gibson Les Paul as well as a double -necked Gibson EDS 1275, and his resemblance to a young Jimmy Page, Adam was an incredibly lucky find! During this time, the band parted ways with their singer, and then Ant left to go on tour with the Lambrettas. This left Adam and Simon in the lurch once more, being only half a Led Zeppelin tribute band. However, Simon was fortunate to play a gig with a crazy loon of a singer called Peter, who expressed a love of Led Zeppelin. Simon and Adam quickly joined forces with Peter, and bassist James from another band Simon was involved with, and CODA – a Tribute to Led Zeppelin was reborn! The band played one gig in this line-up, and bassist James decided to leave! This left them with three-quarters of a Led Zeppelin tribute band, fully committed to being the best Led Zeppelin tribute band out there, and nothing was going to hold them back! With several gigs already booked, the band were lucky enough to find some fantastic musicians to fill in whilst they searched for the ultimate John Paul Jones, including James Watson on bass / keyboards and mandolin, Paul Davis on bass and keys, Sid Pelling on bass guitar and Steve Smith on keyboards. It transpired that the very person was right under their nose, Way back in April 2016, the band had been in need of a bassist to help out when they performed at Beatles Day at the White Rock theatre. This talented musician went by the name of Rob Deery, and it turned out that he too was as much committed to the idea of creating the best Led Zeppelin tribute band out there as was Adam, Peter and Simon. So much so that he even went and learned how to play the keyboards and mandolin, just for the band! In a funny kind of way, it has. Whilst Simon had been playing the music of Led Zeppelin for many, many years, it was only now, with the help of Adam Rose-Alison, Peter Byrne and Rob Deery he has been able to fulfill his dream of forming the ultimate Led Zeppelin tribute band.